Have you heard about Coherence before? Probably. It's one of those famous in-memory grid solutions promising awesome fast data access and unlimited space for your frequently used data. Some of its well know competitors are Infinispan, Memcached and Terracotta Ehcache. They are all great and the worst part with Coherence probably is, that it is NOT open source. This is the first part of a four part series in which I shortly explain the usage of Coherence together with GlassFish. This one is intended to give you a brief overview of the possible scenarios. The following ones will go into more details and describe the configuration with concrete examples. Why did I choose Coherence over any of the other ones? I love working with GlassFish and I was looking for a stable and easy integration with one of those in-memory grids for some data intensive use-cases recently. So the first place to look was the Oracle product stack. 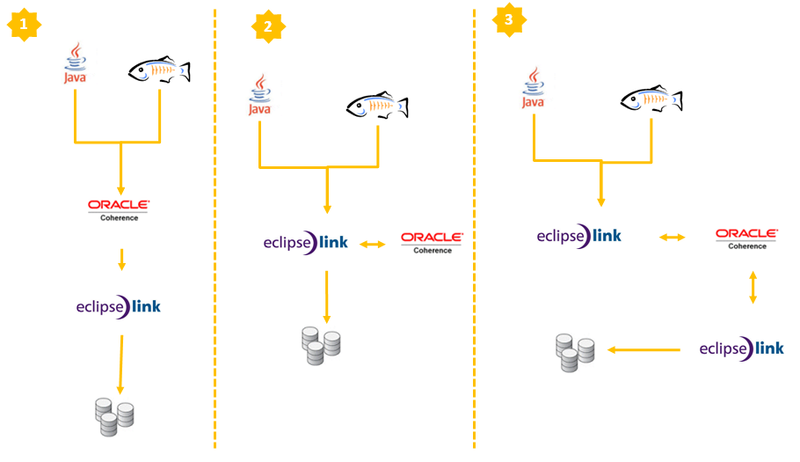 I was more or less driven by the idea that there has to be any kind of integration into EclipseLink which is the JPA 2.0 RI shipped with GlassFish. Especially since there is the new Cache API with JPA 2.0. You can use the Coherence API with caches backed by a database mapped through JPA. The grid accesses relational data through JPA CacheLoader and CacheStore implementations. 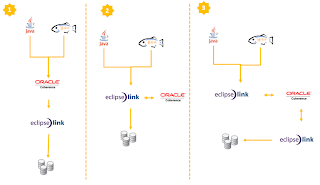 In this "traditional" Coherence approach, TopLink Grid provides CacheLoader and CacheStore implementations that are optimized for EclipseLink JPA. ( EclipseLinkJPACacheLoader and EclipseLinkJPACacheStore) which are both contained in the toplink-grid.jar file. Going this way, you use the standard JPA run-time configuration file persistence.xml and the JPA mapping file orm.xml. The Coherence cache configuration file coherence-cache-config.xml must be specified to override the default Coherence settings and define the CacheStore caching scheme.